Open up a new tab in Firefox (control-T, as you might recall from my earlier post on Firefox shortcuts). Look for the option called browser.download.manager.showWhenStarting (you can also filter for exactly that phrase). That’s it! Next time you download a file, you don’t have to worry about the annoying status box, but you can check on it at any time by pressing control-J to open the window. 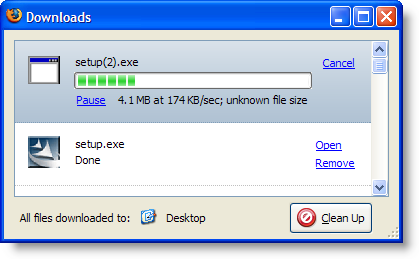 Firefox 3 lets you do this in the Tools>Options>Main, just uncheck the “Show the Download Window…”. And the only notification you get is in the status bar telling you how many are in progress and how long remaining. You can check the window by either control-J, selecting “Downloads” from the tools menu or double clicking on the status bar entry. And you can hide the window again by using “Control-J” again. Thanks for sharing the tips, DngnRdr! Yep, Tools>Options>Main (Toggle Ctrl+J) to view works really well … THANKS!!! Does the download will stop when i close firefox? Hi Jomz- yes, you can’t download something if your browser isn’t open (unless you’re using something like Internet Download Manager, which is a separate application). Thanks a lot, just what I needed. It was beginning to really annoy me having that page popping up all the time.